Anthoecia scira Druce, 1889, in Godman and Salvin, Biologia Centrali Americana, Insecta, Lepidoptera Heterocera, 1:301, pl. 28, fig. 5. Chamoclea benjamini Hill, 1924, Bull. S. California Acad. Sci., 23:158. Diagnosis: Cyptonychia scira has a distinctively ovate forewing. The forewing subterminal area is cream white and contrasts with the purple black upper half of the median area. The basal area and the lower half of the median area are both dark, brassy tan. The reniform mark is a thick lunate white line and the upper half of the median area has distinct light blue reflections if seen in the right light. The hindwing is dark brown. The closest relatives of scira are gladiola and requies. 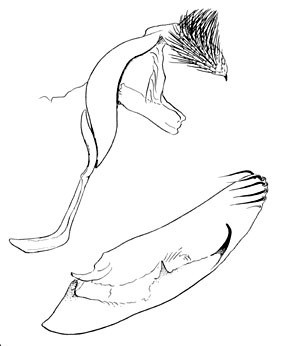 Both of these species are smaller (compare figures 6 and 7 on plate 4). In addition both gladiola and requies have a cream white patch between the reniform and orbicular marks. The outer rim of the frontal process is very weak, particularly its ventral margin. 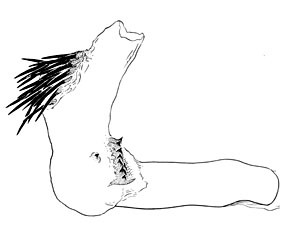 The prothoracic tibial claw is weak and sometimes hidden in the tibia's vestiture. The male uncus (text figures 80B,C,E) is short and greatly swollen. The apical projection of the clasper is thin and recurved. The basal spine group in the vesica is partially fused into a ridge of sharp teeth. 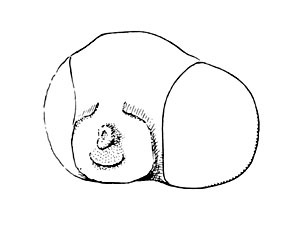 The apical group is relatively small, consistenting of moderately strong spines. 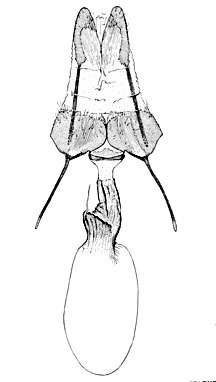 The female ovipositor lobes (text figure 80A) are not developed into long, strongly sclerotized projections and both sets of apophyses are weak. Wing length from base to apex: mean = 12.75 mm., standard deviation = 0.81 mm., n = 10. Distribution: This species is known from Pima, Santa Cruz, and western Cochise Counties in southern Arizona. In Mexico it has been collected in the states of Veracruz, Morelos, and Guerrero. There is little or no variation in the species. Adults have been collected in July and August.